Hats off to your new personalised headwear. Create stupendous personalised caps with our sublimation heat press. Offering endless versatility, our cap heat presses allow you to press brilliant designs onto the front, side or peak of blank hats. Sublimation, transfer or vinyl designs can be pressed in minutes using our compact, easy-to-use heat press. Sturdily constructed and featuring a Teflon coated press surface, creating personalised headwear has never been easier. Simply set the time, temperature and adjust the pressure handle for reliable results, every time. 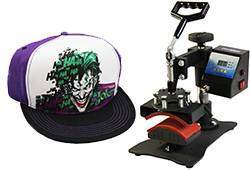 This cap heat press comes with 10 sheets of sublimation paper and is covered under the MonsterShop warranty - so if anything goes wrong we’ll repair or replace your heat press for free.